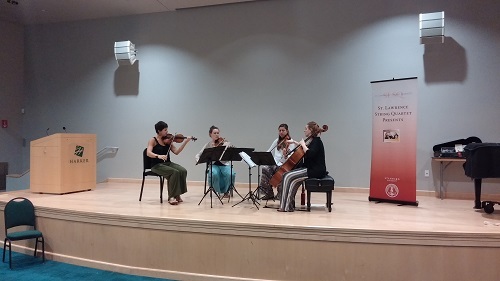 The Maryland-based Excelsa Quartet gave a special workshop to Harker students in early October. Currently a quartet in residence at Stanford University’s Emerging String Quartet Program, the all-female ensemble played selections from their repertoire, offered insights as to how they work together and advised students on how to be more cohesive. For example, the group suggested using words as signals when learning to play rhythmically complex passages and practicing with simpler pieces to warm up for more complex material.